Just like C1 and C2 go together, correct cervical support combined with the right level of firmness can improve the quality of sleep while reducing neck pain. Finally, there is a pillow backed by clinical research to do both1-3. Since 1994, the Chiroflow® water-base pillow has become the new standard for comfort, firmness control and cervical support to facilitate better outcomes for your patients. Have you had it with all those 'therapeutic' pillows that make bold claims of comfort but fall short when it comes to basic neck support? Memory foam therapeutic neck pillows are often advertised as the be-all solution for chronic neck pain but memory foam pillows may not fit your body shape and are not easily adjustable. Chiroflow's pillow can be adjusted to a perfect firmness for the shape of your neck. This is a key feature of the water-based pillow. 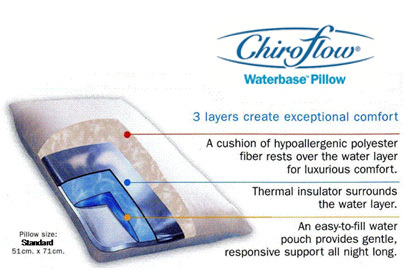 Chiroflow's water-based pillow provides long-lasting comfort for years to come. If you want a fully adjustable, therapeutic support pillow, Chiroflow offers the best pillow money can buy...guaranteed. The Chiroflow™ pillow is backed by our 90-day money-back guarantee.